Y’all…it’s time we step up our banana bread game. Let’s give it a depth of flavor with some whole wheat flour and chopped pecans, shall we? For years I’ve made a classic banana walnut bread, but I’ve developed somewhat of an obsession with pecans after moving to Texas. It’s not like I had never had pecans (which apparently I can’t pronounce correctly according to my Texas friends) it’s just in my New Jersey childhood home they weren’t exactly a staple. Here, anytime we are in a wooded area far from the city I am literally picking them off the ground! I dream of a tiny cabin with a long drive lined with pecans trees but…dreams…maybe one day. 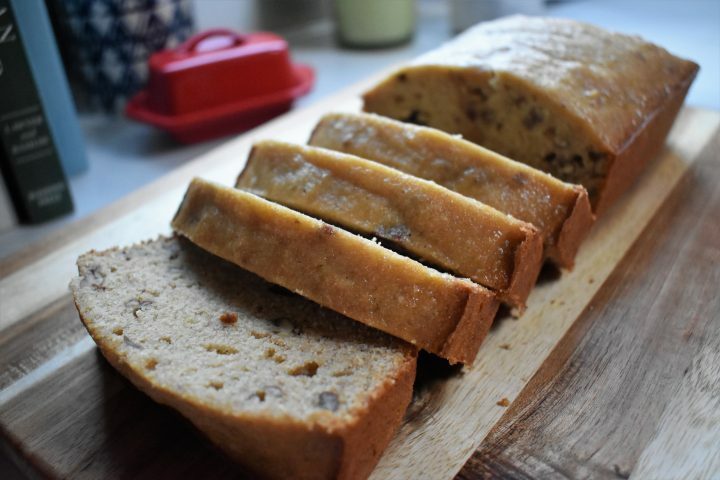 Enjoy this flavorful and hearty banana bread dear friends! Grease your pan. Preferably a 9 x 5-inch loaf pan. Melt the butter and allow it to cool. Beat the egg in a small bowl. Mash the bananas in a large mixing bowl and add the cooled, melted butter, egg and mix well. Add the flour, sugar, baking powder and salt and with either a hand or stand mixer, mix well until the ingredients are all combined. Add the chopped pecans and mix into the batter with a spoon. Bake at 350 degrees for 45-60 minutes or until the top is a light golden brown and an inserted toothpick comes out clean from the middle. Now pour yourself a fresh, hot cup of coffee and enjoy. This bread was delicious — thank you for sharing it with me! ❤️ Thanks Joel! I’m glad we got to share it with you. Yummy, Yum Yum!! The best with coffee!